All campaigns have link and open tracking on. Event triggered campaigns send to unsubscribed users (this allows users to receive password reset emails, for example, even if they are unsubscribed from promotional messaging). Triggered campaigns and API triggered broadcasts don't send messages to unsubscribed users by default, but this can be overriden. Press "Edit" link next to "Tracking enabled and send to unsubscribed"/ "Tracking enabled and don't send to unsubscribed". Select the options that match your needs and press the "Update" button. If you want the tracking links to use your sending domain instead of ours, you will need to add a CNAME record to your domain configuration as suggested in your Customer.io account under Settings - Email Deliverability. 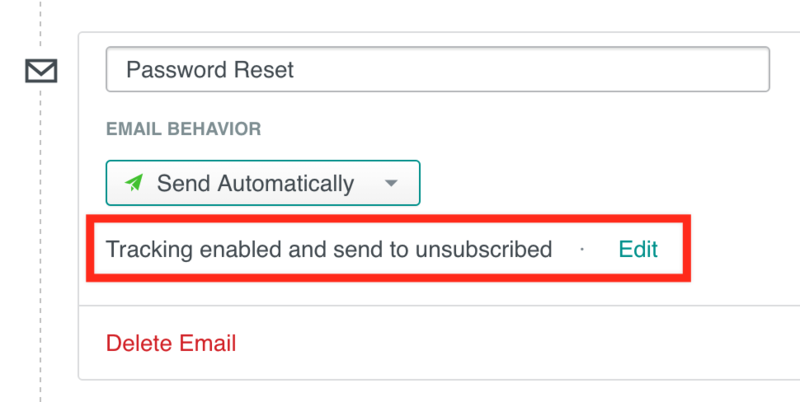 To make sure none of the messages inside event triggered campaign send to unsubscribed users, you can also add a segment filter with the rule "unsubscribed is not equal to true".